This is the gentle reminder hanging at the door of my favorite beach side restaurant. The same rules apply when communicating online. SMS language or textese (also known as txt-speak, txtese, chatspeak, txt, txtspk, txtk, txto, texting language, txt lingo, SMSish, or txt talk) is a term for the abbreviations and slang most commonly used due to the necessary brevity of mobile phone text messaging, in particular the widespread SMS (short message service) communication protocol. Textese is the super cool you at the beach. 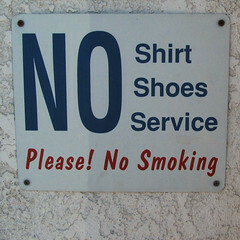 No shirt, no shoes, no problem you can do what you want. Sending an e-mail, creating a resume, writing a blog post, or making online comments is the ready to paint the town looking sharp you. Textese is not good for these formats. Categories: Career Development, Motivation | Tags: charlotte byndas, Text messaging, Wikipedia | Permalink.